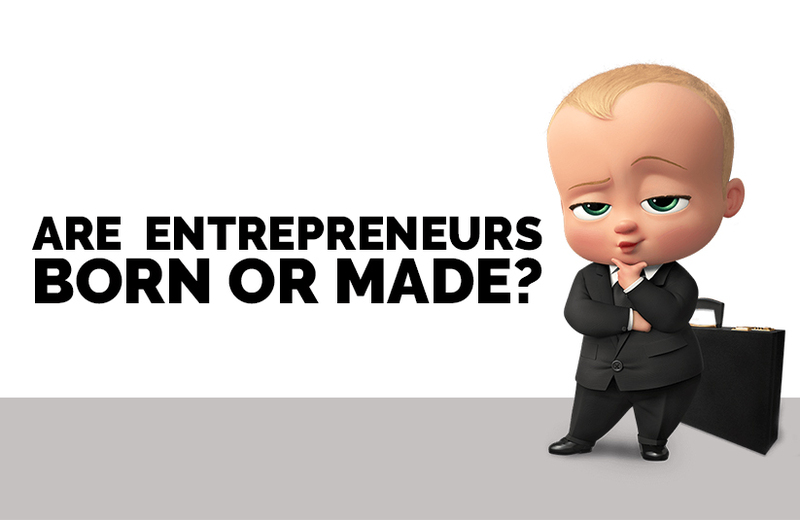 This is a question asked from time immemorial—are entrepreneurs born or made? Do they fall into a category, born with a special talent, drive and the desire, nay, the need to succeed that most of us lack? Or can they be created, entrepreneurial skills learned, and the desire to succeed acquired through a strict regimen of education, experience, mentorship, and learning? Let us dive in and take a closer look. How are entrepreneurs made? Ask any entrepreneur this question, they will tell you that life experiences taught them. Most will be on the agreement that an entrepreneur is more made than born. Many entrepreneurs get started on their entrepreneurial journey with an idea—some take shape, and some sadly doesn’t. This is because of the lack of capital, guidance, direction, and passion. Many other such factors contribute to the separation of their ideas from implementation. To think that entrepreneurs are born would be highly limited to the young entrepreneurs who have the drive and desire to turn their idea into reality. Becoming an entrepreneur is possible by acquiring the skills and deriving the experience from mentors. Without even realizing it, young entrepreneurs have an enormous capacity for change. As they grow and take on new tasks, they become more confident and assured of themselves. As their horizon of knowledge expands, other skills such as the ability to foresee change, calculate risk, perseverance, resilience, and desire also grows and contributes to them becoming an entrepreneur. There are definitely elements of entrepreneurship that can be learned, like gaining knowledge, innovation, and experience, which can be gained by posteriority. Entrepreneurs see opportunity in everything, which is a unique trait and is definitely not inborn. But, how can entrepreneurial skills and characteristics be learned? How to develop those skills? By being passionate, having a direction, having a positive attitude, having your people around, being persistent, and being productive. Successful entrepreneurs have certain skill sets in common, like having a critical mindset, thinking positively, being innovative, and standing up for what they believe in. These are just a few of the characteristics. Entrepreneurs come from all walks of life. The person next door could be the next big name in the entrepreneurial space. The entrepreneurial spirit is a mindset that revels in critical thinking, questioning, innovation, continuous improvement, and self-development, which is not inborn but rather learned. It’s about seeing the bigger picture. It’s about seeking out new opportunities and challenges. Some people are born to be entrepreneurs. Some have a more natural entrepreneurial knack. But keep in mind, the skills and characteristics of an entrepreneur are developed through a constant self-improvement process which can be learned and honed over a period of time. Having said that, it cannot be disputed that there is a surprising amount of entrepreneurial success that can be attributed to their DNA and genetic pool—some are born entrepreneurs and leaders who prove their mettle through hard work. Hence, the answer to this question—are entrepreneurs born or made—is divisive. Ourbusinessladder is a business consultant company in India, offering business consulting services specializing in business advisory and market research. We are also one of the foremost market research firms in Pune We have helped several startups in their business journey and have helped established businesses with their business agenda.